Click on any link provided, to request a planning guide. Be sure to Include your full name, address, contact info and the guides you’d like. This offer is available for North American addresses only. Rely on us to make planning your reunion easy and affordable with these services: Direct contact with hotels to obtain rates and banquet pricing, a single proposal packet detailing military sites, attractions, dining and transportation, follow-up to answer all your special needs, sightseeing service to coordinate your leisure activities. Make your search for the perfect family reunion destination easier! Daytona Beach Area Convention and Visitors Bureau offers Share the Heritage guide highlighting the area’s African-American historical sites and attractions. To receive a free copy downloaded at http://www.DaytonaBeach.com or request here. Greater Fort Lauderdale’s Urban Guide is tailored to the needs of the culturally diverse traveler including insightful vacation ideas, tips and planning resources in the friendly beach resort setting. Accommodations, events, attractions, festivals, music and dance concerts are all included. Tips and inspiring ideas for family events, games and projects to bring relatives even closer together. Request here. Experience the “Very Best of Atlanta!” Shopping, history, attractions. Cobb County has it all. Southern hospitality with all the trimmings. 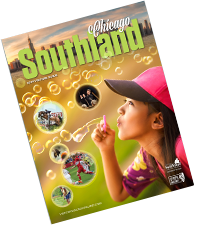 The 2019 Chicago Southland Visitors Guide offers inspiration for your next adventure in Chicago’s 63 south and southwest suburbs. From Outdoor Adventure to Nostalgic Eateries, Microbreweries and over 800 festivals for year-long fun, the Chicago Southland has something for everyone. Request a copy here. Request a copy of the Chicago Southland Reunion Planner Guide or the Military Reunion Planner Guide. Showcases eight Chicago Northwest region communities and a comprehensive directory of accommodations, attractions and dining options for visitors. Available here. Kentucky’s Western Waterland–Vast Shores & Open Doors! 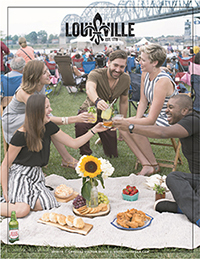 The 84-page, full-color Guide still includes a list of annual multicultural events, noted minority Louisvillians, information about Louisville’s diverse communities (African-American, Hispanic/Latino, Asian and Southeast Asian, Jewish, European, Middle Eastern, African and international students), neighborhoods and historic and international places of worship. A minority Vendor Directory is also included. The Visit Baltimore Official Guide contains details about What’s Hot, What’s Cool and What’s New in Baltimore. You will also find information about our hotels and accommodations, culinary delights, upcoming calendar of events, world-renowned attractions and more. 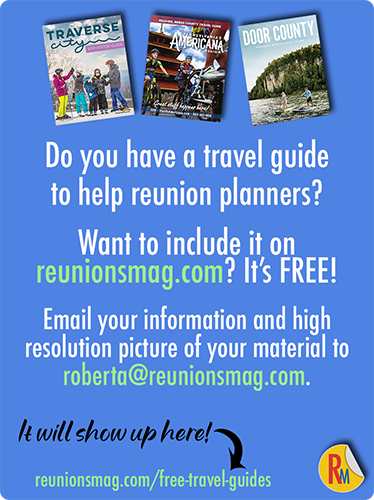 Great for reunion planners, especially the sections about restaurants, lodging choices, transportation and climate. View the guide online or request a copy. The Austin (Minnesota) Convention and Visitors Bureau is a one-stop shop for all reunions. The Austin Official Visitors Guide will help you with itinerary planning, entertainment options, dining and lodging. 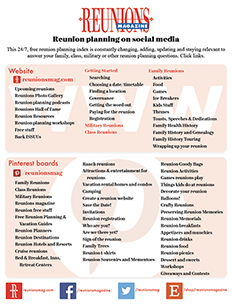 How can you take the worry out of planning your reunion? Since 1940, Cragun’s Resort on Gull Lake in Minnesota has taken pride in creating memorable family events that will exceed your expectations. And although we’ve become the largest year-around family resort, we’re still the friendliest. Named “One of MN’s ideal locations to hold a family reunion” by AAA. Explore Branson Reunion Planner provides wide range of information to make Branson/Lakes, Missouri, area a perfect reunion location. Independence, Missouri, An American Original, offers its Visitors Guide and invitation to visit the Queen City of Trails. Learn about highlights such as the Truman Library and Home, beginning of the Sante Fe, Oregon and California Trails and explore the new Midwest Genealogy Center. Get started planning a Santa Fe visit with the Official Santa Fe Visitors Guide. Find out about the city’s fascinating history, deep cultural roots, Old World charm, beautiful natural setting, and then get together with your friends, family, or classmates in the City Different. Without a doubt, this guide is essential for making your vacation plans to the Lake George Area of New York’s Adirondacks! It’s all about the outdoors, making memories and experiencing hidden area treasures like never before! And it’s easy, this guide has the most informative details on how to get out and enjoy your vacation, no matter what the season! View the guide online. Wilmington, North Carolina, is among the most historically significant African-American regions in the US. African-American ancestry is traced back to the 1700s. The City of Wilmington’s free African American Heritage Guide includes religious, educational, social and cultural sites; copies available here. Whether it is your first or 50th time visiting the City of Brotherly Love, use the Philadelphia Official Visitors Guide to help you plan your trip. 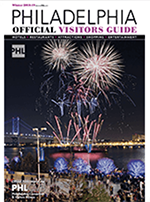 With listings of attractions, tours, restaurants, hotels and much more, as well as a calendar of events and a guide to the City’s diverse neighborhoods, download your copy of the most comprehensive source available for what’s hot, what’s happening and what not to miss in Philadelphia. View here. Our 2019 Travel Guide is now available, so you can discover all the things to do in Pennsylvania’s Americana Region. View our guide online or download the digital edition. We are always happy to mail you a copy, just fill out the online form. Please allow for delivery time. 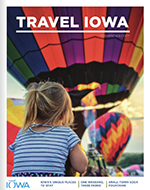 Hershey Harrisburg Travel Guide 2019 is a comprehensive planning guide that spotlights the benefits of hosting an event in the region centrally located for reunions that have members east and west/midwest and introduces the destination. View Travel Guide. Planning a Rapid City and Black Hills vacation, or just want to see what we’re all about? 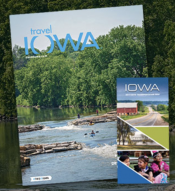 Download our Visitors Guide where you can explore the land of big dreams and big adventures, where you can truly “Do Big Things” and empower your quest to “Find Your Rushmore” – one that is distinct to every traveler. Request Visitors Guide. 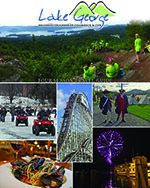 The Fairfax County Visitors Guide is the perfect tool to plan an unforgettable vacation in Northern Virginia. 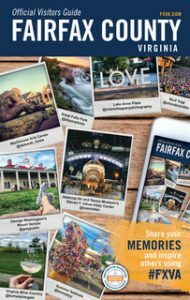 Our comprehensive Fairfax visitors guide offers detailed Virginia travel information and great tips to plan your Fairfax Virginia vacations. Once here, you can always pick up a copy of the visitor guide to carry with you to get around our beloved county. 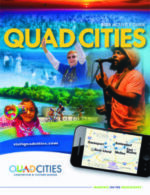 Request a free visitors guide. 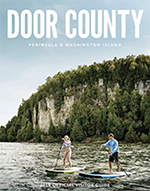 The 180-page 2019 Door County Visitor Guide is filled to the brim with useful information about where to stay, dine, see, do, and experience while you’re visiting the area. It’s perfect reading material whether you have five minutes or you’re sitting down to plan your entire trip. 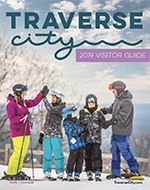 View the 2019 guide online. Please help us be “green” and view our Jefferson County Guide online. If you would still like one mailed to you, please fill out the following information to receive a Jefferson County Official Guide in the mail. Any questions, feel free to contact us. Make your national park experience better than ever. These FREE downloadable national park Owner’s Guides are filled with travel tips and information on what not to miss. It’s your one-stop resource to discover all your national parks! Download today.